Oh sure, we've all heard the story of Jonah and the whale a hundred times. But have we heard it from the perspective of the whale? The one who actually had Jonah stuck in his stomach? Kids ages 4 to 8 will love this creative way of learning about that guy who was supposed to go to Nineveh. And don't miss the other rollicking Bible stories in this series: The Raven and Noah, The Frog and the Plagues, The Lion and Daniel, and The Donkey and Jesus. 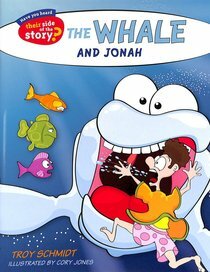 About "The Whale and Jonah (Their Side Of The Story Series)"
Troy Schmidt has writing and video production credits ranging from assignments with Disney ("The Mickey Mouse Club") and Nickelodeon to Max Lucado's Hermie franchise. He is currently the lead writer for "The American Bible Challenge" hosted by Jeff Foxworthy on the Game Show Network. Troy and his wife have three sons.